It is obvious that Erdogon is the loser of the election and the HDP achieved a glorious success on the evening of June 7. The election results put an end to the rise of Erdogan, while it opened a new page for the HDP to provide a new focus of opposition at the national level, and for the leading Kurdish national movement (KM) that leads the party to reshape the Kurdish space beyond Turkey’s borders. Before analyzing the achievement of the HDP, let us remember the background of the HDP project that emerged as part of the KM’s political strategy. H. Bozarslan, a leading scholar working on the Kurdish/Kurdistan issue argues that the “Iraqization” and “Kurdistanization” of the Kurds function as two parallel processes supporting each other. He contends that the participation of the Kurds in political and administrative processes at the Iraqi level (the Iraqization), has allowed them to construct an autonomous space at the Kurdistani level (Kurdistanization). Borrowing Bozarslan’s concepts, I would argue that the KM has been following a similar trajectory in Turkey since 2013 to reshape the political arenas at the level both of Turkey and the Kurdish region. Although some Kurdish nationalists contend that the Turkey-ization and Kurdistanization are two opposing political projects, the results of the June 7 election confirmed that the autonomous construction of a political space in the Kurdish region and the construction of Kurdish oppositions as an integral part of Turkey’s politics are two interrelated parallel processes. Since the foundation of the HDP, BDP has re-organized itself as a regional party to construct an autonomous political and administrative space in the Kurdish region. It changed its name to DBP (Democratic Regions Party) and transferred its PMs to the HDP, while keeping the local governments under its party structure. Alongside the DBP, DTK (Democratic Society Congress) functions as the principal umbrella organization of this construction process at the regional level. It comprises the DBP’s local branches, the local governments, youth movement, women’s movement, pro-Kurdish NGO networks, trade unions, media, and local assemblies in the Kurdish region. Both DBP and DTK have been re-organizing themselves in accordance with eight aspects - political, legislative, self-defense, cultural, social, economic, ecological and diplomatic - of the democratic autonomy project. According to the KM, democratic autonomy is a socio-political project that aims to construct the Kurdish people’s self-government in their homeland. The eight stars in the DBP’s flag symbolize these aspects of the democratic autonomy project. The re-construction of the DBP and DTK at the regional level, the reshaping their political agenda on the basis of the construction of Kurdish self-government in the Kurdish region can be conceptualized as the Kurdistanization strategy. Kurdistanization was just one side of the coin. There is another one: Turkey-ization. While the DBP and the DTK signify the Kurdistanization of the KM, the HDP and the HDK (Peoples’s Democratic Congress) denote its Turkey-ization process. The KM has led the construction of the HDP and HDK as a new focus of left-wing democratic opposition. With the participation of different left-wing, feminist and ecological groups, parties and movements, ethnic and religious minorities, the HDP and the HDK have been attempting to unify and represent all oppressed groups in terms of the class, ethnicity/nation, religion, gender in Turkey with a left-wing populist political agenda. The HDP election manifesto and its candidates represent its pluralist political identity in a striking way. Equality on the basis of class, ethnicity/nation, religion/sect, gender and rights advocacy for oppressed groups at multiple levels constituted the principal perspective of the HDP election manifesto. It proposed a decentralized pluralist administrative and political system based on the self-government of different groups and identities, to guarantee equality across the country at many levels. During the election campaign, it advocated a left-wing populist socio-economic programme, gender equality, a pluralist and libertarian identity politics for the ethnic/national and religious/sectarian groups, and the protection of the environment and promotion of an ecologically sound society. Alongside its political discourse, the HDP has also promoted equality at multiple levels through its candidates who have different political, ethnic/national and religious identities. Alongside the Kurdish candidates, many Turkish left-wing politicians/intellectuals and academicians; Arab, Armenian and Syriac candidates; popular Alevi, democrat Sunni-Muslim, and Christian intellectuals, writers and activists have found a place in the HDP list. Moreover, half of the HDP candidates were women, and among the 80 elected candidates there are 31 women, mostly feminist activists and intellectuals. The HDP has doubled the KM’s votes in the June 7 legislative election. Despite different coalitions, the KM could not get above 5-6% of the vote in previous elections since the 1990s. However, the HDP took 13.12% of the votes and won 80 seats in the 550-seat parliament. This must be seen as the vindication of both the Kurdistanization and Turkey-ization strategies. The political map of the Kurdish region changed in this election. The hegemony of the KM has both deepened and expanded. The KM had remarkable support in the 15 provinces and was a marginal political movement in the remaining 10 provinces in the Kurdish cultural region in previous elections. The HDP expanded this “political region” from 15 provinces to 20 overall in the June 7 election. In this expanded Kurdish political region, the HDP has marginalized the AK Party in many provinces. There was a political balance between the KM and the AK Party in the Kurdish political region, and the AK Party had the majority of Kurdish votes in the large Kurdish cultural region in previous elections. Yet, in this election, the AK Party lost the Kurdish voters’ support dramatically. The HDP is a hegemonic power in the 12 provinces (55-87%), maintains the balance of power in 4 provinces (30-44%), and is a redoubtable opposition force in 4 provinces (15-23%). 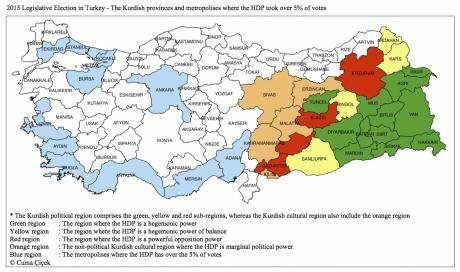 Moreover, in “the non-political Kurdish cultural region” including 5 provinces where pro-Kurdish socio-political and socio-cultural mobilization is very marginal, votes for the HDP have also remarkably increased, although they are under 10%. Moreover, although the KM has not been able to gain above 5% in the metropolises - except for Mersin and Adana - since the 1990s, in this election, the HDP passed the threshhold in Istanbul (12.60%), Izmir (10.54%), Adana (14.56%) and Mersin (17.90%); and came close to the election threshold in Antalya (7.23%), Aydın (9.10%), and Kocaeli (7.66%), while increasing its vote dramatically in Ankara (5.57%) and Bursa (5.85%). As a result, the HDP won 21 parliamentary seats out of 80 from the metropolises (See. Map). The source of HDP success comprises principally the liberal, conservative, and right-wing votes. The HDP managed to persuade the Kurds who were supporting the right-wing AK Party in previous elections. The party doubled up its votes in the Kurdish political region while marginalizing the AK Party. In the major towns, the CHP (Republican People’s Party), the main opposition party, mostly kept its votes, and the HDP’s new votes principally came from the AK Party. Alongside the liberal, conservative, right-wing votes, the Alevi Kurds who have a predominantly left-wing political identity and orientation also mostly supported the HDP. In Dersim (Tunceli), the symbolic center of the Alevi Kurds, the HDP took 59.91% in this election, while it took only 22.96% in the previous election. However, HDP success cannot be reduced to Kurdish votes. The HDP has succeeded in becoming a new focus of the opposition of liberal, democratic, reformist and revolutionary left-wing, as well as feminist non-Kurdish people. The party’s candidates from different parts of the society, and its pluralist and libertarian discourse underlining multi-level equality, made it easy to mobilize different groups in the context of the election campaign. The quantitative effect of each group may be limited, yet their qualitative effect is enormous. How can one analyze this success? Several trends must be noted. First, the Kurdish national movements have been rising in the Middle East since 2003, when Iraqi Kurdistan Region was established. In 2012, the Kurds in Syria managed to establish three cantons in Rojava (Kurdistan regions in Syria) and still control their homeland. These events have changed the geopolitical equation of the Kurdish issue in the region and affect Kurds from all over the world, and from Turkey in particular. Moreover, the punishing war between Kurdish forces and ISIL both in Iraq and Syria has been mobilizing Kurds from all over the world since the summer of 2014. Indeed, the KM did not increase its societal support just in the last election; rather, it has gradually expanded and deepened its hegemony in Turkey over the last decade. One can easily note the resurgence of the KM not just in local government and the national parliament, but also in civil society networks, in media and in the streets. In brief, HDP success cannot be understood without taking into consideration the ongoing Kurdish spring in Iraq, Syria and Turkey over the last decade. In this respect, the war between the Kurds and the ISIL in Kobanê must be particularly noted. The Kobanê war has become a “national” event mobilizing the Kurds and growing their national feelings and thoughts all over the world. The AK Party’s sectarian and nationalist policies in Syria and Rojava in particular, and its position during the Kobanê war came as a shock to most of the Kurds supporting the AK Party. Second, we must underline the positions of the KM and AK Party concerning the peace process in Turkey. The KM’s positive stance with regard to the peace process and the rise of a legal democratic politics have strengthened the HDP. The open, sincere, reassuring and stable role of the HDP in the ongoing peace process increased the party’s credibility throughout society. Conversely, The AK Party, President Erdogan in particular, adopted a narrow, insecure, and unstable position during the peace process, and this has disappointed most of those who believed that the AK Party will build peace and find a democratic and fair solution to the Kurdish issue. In this respect, President Erdogan’s statements saying that there was no negotiation table and opposing the monitoring committee for the peace process during recent months must be strongly underlined. Third, the HDP’s integrationist policies in approaching socio-economic, ethnic/national, religious/sectarian and gender-based inequalities and in advocating equality, liberty and pluralism at many levels way beyond the Kurdish national struggle elicited a remarkable response in many parts of the society. The Kurds who mostly live in the metropolises and have already well integrated into Turkey welcomed this political position in particular. This position also convinced non-Kurdish liberal, democrat, left-wing, feminist, radical Muslim voters. Fourth, the HDP libertarian secularist position criticizing state control over religion, and emphasizing religious rights as well as the equality of religions has considerably undermined the AK Party’s influence over pious Kurds and banished the suspicions that arose from governmental allegations to the effect that the HDP is anti-religious party. Besides, the HDP’s intellectual Muslim candidates, including several women wearing a headscarf, notably influenced people and convinced them regarding the party’s libertarian secularism. Fifth, the very successful HDP election campaign led by co-president S. Demirtas’ performance must be underlined. Unlike previous elections, the HDP organized a very influential campaign. In this campaign, the effective usage of social media and the support gained from some mainstream media played a very critical role in the HDP’s success. In this regard, the rise of Demirtas as a young, sincere, honest, intellectual and populist political leader opposing President Erdogan must be particularly underlined. Last but not least, many voters made a strategic choice and supported the HDP in order to stand in the way of Erdogan’s presidency. For the HDP to cross the election threshold was the only realistic way of preventing the AK Party’s single-party qualified majority stance that would allow the party to change the constitution single-handed. Indeed, the HDP election slogan - that “we will not allow you to be the president” - has played a critical role in the HDP success, preventing the AK Party from forming a single-party parliamentarian majority.